Gore has been making bike gear for 30 years now (as shown here) and some of what it's learned has been distilled into this Oxygen 2.0 Gore-Tex Active anniversary jacket, which is an excellent hard shell for winter riding in all conditions. At north of £200 it's expensive, but you won't be disappointed with the performance. The Active in the name refers to Gore's Active membrane, which is "built for extreme breathability and ideal for highly aerobic, done in a day activities", according to Gore. "All components are built for optimized sweat management to ensure extreme breathability and optimum comfort in high aerobic conditions. The performance is also supported by a tight fitting and minimalistic garment design.' So there you go: expect a high quality race-fit top that's good for sweaty, high-intensity riding. That's what Gore promises, and that's what it delivers. This really is an excellent fast riding top. The cut is sufficiently bike-orientated for it to feel a little ungainly off it – it pulls at the shoulders a bit and feels tight across the chest. Once you're on the bike and riding, though, it's exactly right. There's plenty of room in the arms without them being over-long or wide, with a zip cuff to allow you to get your hands in without needing extra material. The collar rises at the back to keep more of your neck covered (and more water out in a downpour) and the tail drops to cover your lower back well. It's elasticated too, with silicone grippers to keep it in place. I felt I could have done with maybe an extra few centimetres of length. There's some subtle gold reflective on the tail, and also on the arms, collar and cuffs. If you don't want a stealthy black one there's a black and red option too. The jacket doesn't have any pockets, instead opting for two long zips that allow you to get into your jersey for snacks or spares. If you're a bit warm these can also be opened for venting, although obviously that compromises the waterproofing of the jacket. And being waterproof is something it does very well. Fully taped seams all round mean there's no water ingress through the fabric and the aforementioned collar and cuffs are better than most at guarding against trickles. I've completed two-hour rides in genuinely unpleasant conditions with very little dampness getting in: a small amount from the side zips, and a little soaking in from the cuffs, but nothing through the fabric, at all. The Active membrane also makes the Oxygen 2.0 jacket very windproof. I'd struggle to name another jacket that's better in that regard. Tight cuffs and collar and an excellent riding cut, coupled with a storm flap behind the main zip, mean that it's a welcome outer layer when the cold winds are blowing in from the north. Plus there's very little excess material to flap about, making it a quiet jacket even in the blowiest conditions. All this would be to nought if the Active fabric didn't breathe well, because you'd just be a soggy mess after an hour's riding. But again, it's excellent. After two hours of hard riding in the dry, in temperatures in the low teens – which are very much at the upper end of what you'd expect to be needing this for – taking off the jacket revealed that my baselayer was still essentially dry, as was the inside of the shell, which meant the jacket had coped admirably with getting rid of any excess moisture. The one time I did manage to get a bit soggy was on a two-hour chaingang in the pouring rain, where the combination of near-race pace coupled with constant spray from following wheels managed to breach the Gore's defences. I think most of it just dribbled down the front of my neck, to be honest. Even then the jacket was windproof and warm. I've got very little bad to say about this offering from Gore. The fabric is excellent, and the cut on the bike is almost perfect. I would have liked a little extra length in the rear but that's the only niggle. At £220 it's certainly in the upper echelons, but if you're not too bothered about the 30th anniversary badge and the gold piping then last year's jacket, which is essentially the same, can be snapped up for less than £150. And that, my friends, is a stone-cold bargain. Gore says: "This GORE-TEX® Active jacket offers maximum breathability for the dedicated performance oriented road cyclist who trains in all weather conditions. A slim race cycling cut provides perfect fit. Two zipped side openings allow for easy access to the jersey pockets." Really well put together and finished, feels like a quality jacket. Great in the rain, great in the wind. No issues during testing, material finish is hardy and seams are well finished. It's a really waterproof jacket, and the collar and cuffs are well designed too. Very good for a full waterproof. Definitely cut for a fairly aggressive position on the bike. L was a race fit on me, which is what I'd expect. Just about packable into a jersey pocket, but this is the jacket you dig out when you *know* it's wet or cold. Excellent fit means it's comfy on the bike. Best with long-sleeved stuff underneath. Definitely not cheap, but represents good value for money if you're serious about going out in all weathers. It's machine wash and Gore recommends a tumble dry on a low heat to keep the surface beading. It's been easy to care for. A bit more length in the tail would have been nice. Not cheap, but you get what you pay for here. This is a top quality waterproof. That badge is in a funny place. I got me one of these a month or 2 ago and I absolutelty love it, it's super dry and breaths very well. Had it on while it was storming and nothing got in. As for the breathing, I use it often even if I know it isn't going to rain, it's a great windproof jacket to. Looks good - like the gold labels. Wish it didn't have 2015 on the badge though (hardly going to buy something now with 2015 written on it) - just 1985 on the badge would have been fine and not dated the garment. I note matching bibs or possibly waterproof winter bibs in the photos. Is there going to be a review of them? Yes, yet another cycle top - and one for rain and hence overcast or dark conditions - in stealth black. Ok, it's also (apparently) available in soon-to-be-grey White, but not in an hi-viz & fluorescent colour for those who (1) want to be easily seen by drivers who want to see cyclists; and (2) don't wish to give drivers & their insurance companies an all-too- often accepted 'excuse' for not seeing them. Why is it that clothing companies like Gore so often want to cater only or largely for the 'looking cool beats being easily seen' cyclists? Surely, there is sufficient demand for them ALSO to cater well for cyclists who place being seen as more important than looking cool? I'm not decrying those who prefer stealth black at all - it's their right to wear what they prefer/choose - just puzzled that Gore et al don't cater equally as well for the more safety conscious cyclists. you could always get last year's, in a nice bright red. there's still plenty around and it's cheaper. Good question Kadenz - I'm on of those who'd never wear bright colours, but i do think it's odd that so many clothing companies don't offer stuff in fluro yellow as an option. My guess is it's to do with fashion, and where a company's biggest markets are. 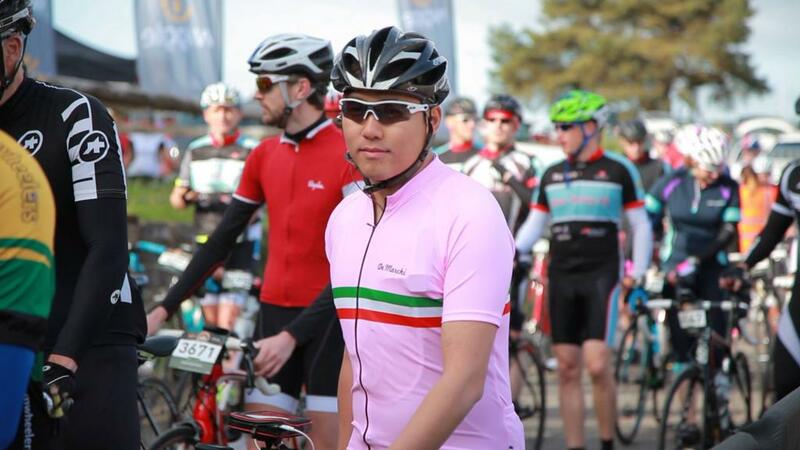 Over the last couple of years there has been a lot more fluro and hi-viz performance gear, partly I think because those colours were fashionable - particularly in Italy - but what comes in to fashion goes out again too - black is always a safe colour. White is the fashion colour in Europe now. If you're producing high end garments in relatively short runs and you're selling them across a number of territories you're probably going to go for the colours you know will sell. So that's a fashion colour + black/navy/grey with maybe red as a second fall back. My observation, and that of some of the other guys here is that fluro yellow is a particularly British thing - you don't see much of it in Europe (when it's not in fashion) so from a clothing company's point of view if you're spreading yourself across a lot of markets you probably want to ensure you've got a range of colours you know will sell everywhere rather than different colours for different countries. By contrast British brands like Endura, Altura or Lusso - that make the bulk of their sales in the UK would always have multiple bright yellow options in their ranges. To those who moan about the lack of bright colour options, just get yourself a +60 lumens rear light and be done with it. It'll make more difference on a dark day than the colour of your jacket. Hmm... This or the sportful fiandre extreme jacket? Are they even simular products or designed for different situations? Seems like this jacket is old hat now that the new 2 layer Gore-Tex Active has been released. The new fabric is much lighter but just as waterproof, allegedly. This jacket breathes like a PLASTIC BAG!!! I owned one. Every independent test of Gore-tex membranes vs. the competition show how poorly Gore-tex's membranes perform. The new Gore Active (NOT the version in this jacket) released last month may be the exception... because it actually has an air permeability greater than 0. But this jacket has an air permeability of zero... the same as a plastic bag. By the way, the non-anniversary version of this jacket is available in fluoro yellow. Let's not get carried away with hyperbole. While it's true that there's degrees of effectiveness I'd be surprised if this wasn't one of the more effective out there. A plastic bag has zero breathability. Even if you cannot demonstrate Gore's claims, this will breathe better than a plastic bag. And an Altura Night Vision. The best rain jacket I found was the Madison Race Apex. It performed as well as a Gore, or Rapha, and was under £90. In the end, given that most of my riding is tempo, I even ditched that and now wear a Parentini Mossa in the wet. The air permeability of the membrane in this jacket is 0 CFM. The air permeability of a plastic bag is 0 CFM. Maybe if you sweat buckets or ride in +20C, the thing that impresses me most about this jacket it how much it DOES breathe, I have never had any problems on that front no matter what they 'prove' on youtube. Added to that, past experience has shown that genuine goretex appears to be the only truly waterproof (and breathable) material too, but I have no idea why it is still so expensive for many applications. Its not air that we hope to move through the fabric though, is it? It's water vapour. I think the tech behind the fabric is that capillary action draws water vapour that settles on the inside of the jacket through the membrane to the outside (via capillary action). That doesn't require the membrane to easily allow air to pass through. Other fabric like neo-shell accomplish their internal temperature and humidity regulation differently by allowing air to pass out of the fabric. That may or may not provide a better experience for the user but it doesn't mean that goretex technology can't work to transfer moisture out of the jacket. Its not air that we hope to move through the fabric though, is it? It's water vapour. The moving air can transport a lot more water vapor than other means. That's why NeoShell and eVent are so much more "breathable" than Gore's membranes.